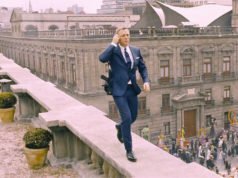 In Casino Royale‘s black & white opening sequence, one of James Bond’s outfits is a navy blue linen suit made by a bespoke English tailor, not Brioni. Blue is the best of the dark colours for linen suits, which are most commonly found in lighter tones such as cream, beige and tan. Bond’s suit has soft shoulders and a button two front, with the high button stance that was popular at the time. 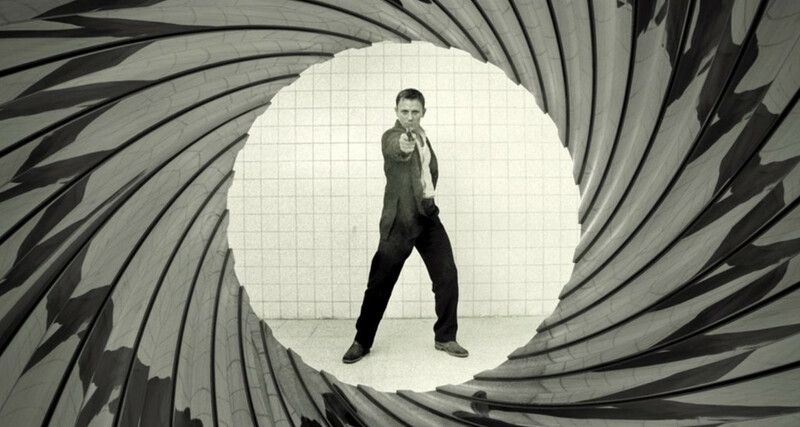 The high button stance doesn’t function well when closed, but Bond wears it open anyway. The jacket has swelled edges, four-button cuffs, double vents and open patch pockets on the hips. The patch pockets are a classic feature on warm-weather suits as they don’t require a lining to be placed inside, and they go well with the suit’s more casual cloth. We don’t see if the breast pocket is also a patch pocket or if it’s a welt pocket. The trousers have a flat front, straight legs, plain hems and are worn with a belt. The blue and white end-on-end shirt is likely a linen and cotton blend. It has a tall, two-button spread collar, front placket and short sleeves. 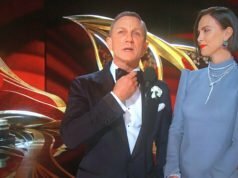 Short sleeves shouldn’t be worn with a suit, even such a casual one, but short sleeves with a suit recall how Ian Fleming dressed James Bond in his stories. Though most suits should be worn with a tie, a casual linen suit is one of the few that can successfully be worn without one. Bond wears the suit with snuff (light brown) suede chukka boots and a medium brown leather belt. Though the scene is in black and white, colour photos can be found in the book Bond on Set: Filming Casino Royale by Greg WIlliams. Never really been fond of this suit and the way it hangs rather lifelessly in that first pic. I love the blue/navy/brown coordination though. Are swelled edges common on jackets of light material? I’ve always associated them with tweeds, etc. Now that it’s getting warm will you cover the striped shirt & cream pants ensemble Connery wears to Largo’s estate in the daytime? Swelled edges are common on less formal jackets, light or heavy. I’ll probably get the striped shirt article out this coming weekend. Just out of curiosity, do you have any idea who made this suit? Perhaps the same unknown maker as the grey linen featured later on in the film? What about the shirt? Sorry, I don’t know who made these clothes. I like this; it is fine for what it is and given the scene in which it appears, it is difficult to get an idea of the cut, fit, etc. Plus, this plays into that awful marketing trope for Casino Royale (which I think is one of, if not the best film of the series) about how Bond became Bond, as if somehow putting on a three piece Brioni suit at the end of the movie makes Bond, Bond. That said, this strikes me as something the literary character would wear too. Christian–You make an excellent point regarding the similarities between this and they type of outfit one could easily imagine Fleming’s Bond to wear, right down to the short sleeved shirt. Fitting considering that Craig’s portrayal of Bond, in my mind, is much closer to Fleming’s version than any that came before him. I also completely agree about Casino Royale being one of the best Bond movies. It’s my generation’s OHMSS ! I can’t point to specific evidence of the marketing trope, so if I am wrong, I retract. But I recall that being the marketing strategy in general, and I presume that it extended to the clothing. I think we referred to this in other comments on this blog, but I don’t have a specific example, and I frankly don’t want to hunt for the evidence. I agree on the fit of that last suit. Bizarre, since there are some beautiful and well-fitted suits in CR. And I agree that OHMSS is another top-tier Bond film, especially its opening act through Bern, and its last 45 minutes. I like the outfit, it’s well-suited for the climate and the occasion -a violent fight-, and the suit has nice casual summer features. I am just not mad of the short-sleeves shirt worn with a suit though, he could certainly have worn a long sleeeves linen shirt -or voile, that’s even bettter for the look. Brown shoes with blue trousers? That’s one gaffe even us Aussies keep away from! The short sleeved shirt doesn’t trouble me so much, if the suit is taken as lightweight, hot climate attire. In the context of CASINO ROYALE, this is Bond before he has to blend into a higher echelon of society to execute his mission. Brown shoes with a blue suit is something Americans and Italians love to do. Some Americans I know would never think to pair black shoes with a blue suit. Agree. Brown shoes with blue trousers is spot on. But not after 6 pm if you are a true gentleman. I must say I think it does have a certain charm about it. Especially with the boots. I much prefer Daniel craig in more fuller fitting clothing as opposed to the skin-tight getups of Skyfall. Can anyone upload color photo of this suit (with jacket) from Williams book? I believe in Connery’s style choices of black shoes with lounge and (obvious) dinner suits. Brown shoes with linen and sports wear respectively. That said I once saw Patrick Grant in a worsted glen Urquhart check two piece suit with burgundy/ox blood semi brogues which looked very well. But I think of Grant as being more a dandy. In term of color only, I have the impression that a light/medium grey suit works better with dark brown shoes than black shoes. I often wear brown shoes with blue lounge suits and burgundy shoes with greys. Despite what the English rules might say about this, I think it shows some panache without being ostentatious. Yeah I think you’re right. Sometimes I feel I restrict myself with the old fashioned English rules. I need to stop reading Hardy Aimes so much. Also agree that burgundy has a natural harmony with medium greys. Does anyone have an opinion on tan/chestnut shoes? I have tan Oxford toe caps and seam to always wear with brown twill trousers. I’ve not tried anything else. Matt, thank you for pointing out that suits should always be worn with ties. This ghastly affectation of wearing open neck with suits is getting completely out of hand. It’s neither smart, nor casual. It is a mess. And the older you are, or the hairier you are, the worse you look. Having pontificated arrogantly on that, I agree that the linen suit is the one and only exception to the above rule but it should never be worn for business or to a formal occasion. I wish the men in my office shared those sentiments. 90% wear open neck shirt with suits. They think it looks better by some accounts. It is ghastly. And what is even worse is wearing cuff links with the open neck shirt and suit. Total confusion! I wouldn’t totally discount wearing a suit with an open-collar shirt when in casual situations. Roger Moore in Moonraker, Brosnan in The World Is Not Enough, and Craig in Casino Royale all wear this look well, in my opinion. In a warm climate and for casual occasions I think it looks good, provided that the suits are of a more casual nature rather than a business pedigree. These are the three examples that immediately come to mind, but I’m sure there are others. I couldn’t agree more! Hairy chests and turkey necks should not be exposed for the whole world to see. This is another example of our worship of the twin idols of comfort and hipness. I can’t wait for this fashion to pass. What you say is absolutely true, regrettably. No doubt one day we will be wearing jackets with one long sleeve on one arm and none on the other. Ditto the trousers. It will be modern and fashionable and, thank God, I will not be around to see it. Then again, futuristic movies from the 1950’s had us all wearing shiny jumpsuits, and that never came about. I, for one, hope the trend towards informality is reversed before we all run around in loincloths! Perhaps it is generational (though I an not that young at 40) or geography (I live in Los Angeles and before that, Silicon Valley and Chicago) but I have no problem with the no tie look . As a professional, sometimes I wear a tie, sometimes I don’t. It depends on what the situation requires. Brad Pitt in Ocean’s 11 and Rupert Penry-Jones on the BBC Show M.I.5/Spooks looked terrific in suits without ties. As did Roger, Pierce, and Daniel as Kyle notes above. I don’t see this a case of a fashion trend or a hipness issue. I generally think suits look better with ties, but that isn’t an unbreakable rule and it is very context dependent. And as Sir James Maloney correctly notes, the trend has been to one of increasing informality. And that is the problem, Christian. The trend to informality in formal situations. I’m afraid you Americans are responsible for this and we now have to put up with casual Fridays which is one of the biggest eyesores on the planet. In a work environment, people should wear a tie. They simply look better. If they want to wear a suit casually without a tie, that is their business, their lookout and frequently their delusion, especially for the over 50’s. I think it may be down to personality and taste. I’m 28 and have always had a profound appreciation for formal wear, especially tailored lounge suites. in the uk I’m finding that the older generation men are dressing a lot more relaxed compared to the younger men. It’s quite a complex topic really. Geography, age…….hard to pin down the variables. I do agree that a professional workplace such as mine looks better suited up. A tech company in Silicon Valley, which is often a free-form creative endeavor, not so much. And I also agree that the over 50 crowd are generally the ones who can’t quite figure out the suit/no suit/what looks good for casual business wear conundrums. About the discussion above about wearing casual/summer suits without a tie, Brosnan did it also very well in Goldeneye with a beige suit and a white shirt. That is very interesting! Dalton wore a very similair suit and shirt in The Living Daylights in Tangier, only with a better cut IMO than the Brioni one, but everyone seems to think that was a bad outfit on this site. I wonder how it comes, since Pierce wears the same type of outfit here and nobody has mentioned that as “bad”? As for my remark on the Brioni cut, I really dislike it, it looks like the suits are a size too big, especially on someone with Brosnan’s physique. He is stiff in himself, but in theese suits he practially drowns. 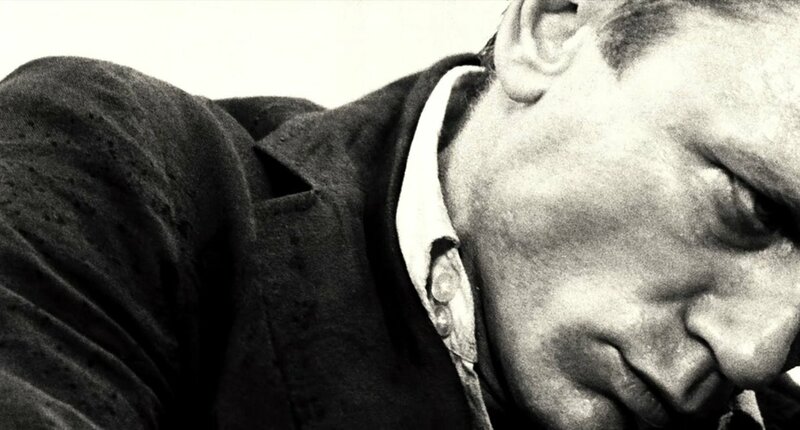 Way too affected by then, just like Roger Moore. Not to mention that Bond should never wear Italian flashy suits, he’s British to the bones. His suits in Remingtoon Steele had a much better fit but then again, he didn’t look very Bondish in them, being extremely slim and having that big hair and pretty-boy face. In my opinion he looked his best in Tomorrow Never Dies, he was the perfect age and in much better physical shape than in GoldenEye (mabey he did some work-out in order to look more convincing in action sequences) and it was before he got too chunky in TWINE.